Don’t you wish you were your own boss? Have you been dying to learn a new language? These kids didn’t wait until they were “old enough” to make those dreams come true. From a 9-year-old who speaks eight languages to a 12-year-old bow-tie-wearing entrepreneur, here are 15 superkids—none of them older than 17—with big talents and bright futures. Asia Newson, known as Detroit’s youngest entrepreneur, is the co-founder and CEO of Super Business Girl. At just 11 years old, she sells homemade candles to help the needy in her community. In the future, Asia hopes to open a shop in downtown Detroit and several shops across the city. “Since I was about 4 or 5 years old, I’ve always had, like, the vibe or, like, I don’t know, little power ball that keeps me going,” Asia told 20/20. Esther Okade loves Barbie dolls and Elsa from Frozen, just like any other 10-year-old. But Esther, who is British Nigerian, is not your average preteen. She is a math genius and is already enrolled in Open University, a distance-learning program in the United Kingdom. “It’s so interesting. It has the type of maths I love. It’s real maths—theories, complex numbers, all that type of stuff,” she told CNN. “It was super easy. My mum taught me in a nice way.” Esther hopes to get her Ph.D. in financial math by the time she’s 13, and she also wants to have her own bank by 15. 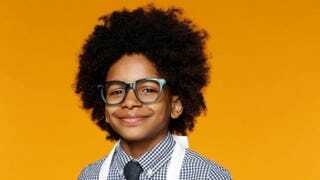 Moziah Bridges may only be 12 years old, but he already runs a six-figure business. Moziah started Mo’s Bows in Memphis, Tenn., after growing tired of the poor selection of kids’ bow ties he found in stores. His grandmother taught him how to sew, and he created several bow ties. His friends and family members fell in love with them. “I like to wear bow ties because they make me look good and feel good,” Moziah wrote on his website. “Designing a colorful bow tie is just part of my vision to make the world a fun and happier place.” In the past three years, Moziah has appeared on Shark Tank and in Vogue and O: The Oprah Magazine. Vidal Chastanet’s story all started with a simple question: “Who’s influenced you the most in your life?” His answer? His principal, Nadia Lopez, at Mott Hall Bridges Academy in the Brownsville section of Brooklyn, N.Y. “When we get in trouble, she doesn’t suspend us,” the 13-year-old said. “She calls us to her office and explains to us how society was built down around us. And she tells us that each time somebody fails out of school, a new jail cell gets built. And one time she made every student stand up, one at a time, and she told each one of us that we matter.” This answer was featured on the website Humans of New York, and soon after, it received more than 1 million likes on Facebook. It garnered the attention of President Barack Obama, which led to Vidal, Lopez and HONY documentarian Brandon Stanton being invited to the White House. Want a cookie? Try these from 10-year-old Cory Nieves, better known as Mr. Cory. He goes door-to-door in Englewood, N.J., pulling his wagon to neighborhood barbershops and car dealerships. Cory started the business five years ago after his family moved from the New York City borough of the Bronx to New Jersey. Although Cory is the founder and head of distribution of the company, his mother, Lisa, bakes the goods. Cory hopes to be a fashion mogul one day. Chris Suggs, 14, wants to make Kinston, N.C., a better place, one young person at a time. He is the founder and president of Kinston Teens, which aims to beautify the community, connect young people with city leaders and raise awareness about issues that affect youth. At Kinston High School, he is the freshman class president, and at his church, he is the youth department leader. And if his Facebook page’s URL is correct, he could be the future president of the United States. Zuriel Oduwole is the youngest working filmmaker in Hollywood. Zuriel, 12, is also the youngest person to be featured in Forbes Africa. She has interviewed more than 14 presidents and prime ministers, including the heads of Liberia and Jamaica. Zuriel has also talked to tennis greats Venus and Serena Williams. Her feature documentary, A Promising Africa, opened in London in January. When Adam Kirby was just 2 years and 5 months old, in 2013, he became the youngest boy to become a member of Mensa, the IQ society. By the time he was 9 months old, Adam, who lives in South London, already knew how to read. Shortly afterward, he potty-trained himself after reading a book on the subject. “He is really, really hungry for it. It’s not us pushing him at all; he loves challenging himself. He gets bored very quickly when he’s not reading or writing or completing a complex puzzle,” said Dean Kirby, Adam’s father. You’d think that DJ Fulano was at least a few decades older, once you heard the list of artists he listens to: Michael Jackson, James Brown, Fela Kuti and Stevie Wonder are just a few of his faves. His mentor, DJ Cassidy, told Ebony magazine that Fulano’s “uncanny ability to read people supersedes his age.” At just 11 years old, he’s rubbed elbows with former President Bill Clinton, Diane von Furstenberg, June Ambrose and several other notables. “I decide what music I play depending on the audience. I play pop for kids and hip-hop, soul and funk for adults,” said DJ Fulano. Gabrielle Jordan knew from a very early age that she didn’t want to work for anyone else. She started her own business, Jewelz of Jordan, when she was just 9 years old. Gabrielle, now 15, is also the founder of ExCEL Youth Mentoring Institute, which hopes to inspire more young people to be entrepreneurs. She has become the youngest member of the Black Speakers Bureau and has already given a TEDx Talk on entrepreneurship. Her book, The Making of a Young Entrepreneur: A Kid’s Guide to Developing the Mind-Set for Success, written under the name Gabrielle J. Williams, was a best-seller on Amazon.com. This year she was honored as a M.A.D. Girl at BET’s Black Girls Rock 2015. “When I reflect back on my life, I want it to be filled with big dreams, big actions and big accomplishments, and that’s what I want for others,” she said to BET. Courtesy of Warren Cassell Jr.